Icelandic lore says that a bird's nest in a Christmas Tree brings a year of good luck, good fortune and good health. What do you traditionally include on your Christmas tree? 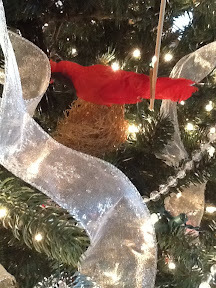 I have some little nutcracker men I have used on the tree since my girls were little. My youngest daughter kept some of the ornaments she made in school and still puts them on her tree. this year, i haven't done much of anything. my tree has the lights it came with, a nativity set (hallmark ornaments), and a few (3) clip-on things (97 cent box at Walmart). I added a couple of ribbons. Isaiah was supposed to help me decorate the tree but we haven't done that yet. Peacock ornaments; mindful of the feathers we used in the decorations for our wedding and reception. my goodness, then i need one asap.